Seoul, Nov 29: North Korea on Wednesday fired a ballistic missile that landed into the Sea of Japan, the media reported citing officials. The missile, believed to be an intercontinental ballistic missile (ICBM) by the Pentagon based on initial assessments, was launched from Sain Ni, North Korea and flew roughly around 1,000 km before landing in the Sea of Japan, Fox News reported. The missile flew east for about 53 minutes before landing off the north of Honshu, Japan's largest island, the New York Times reported. 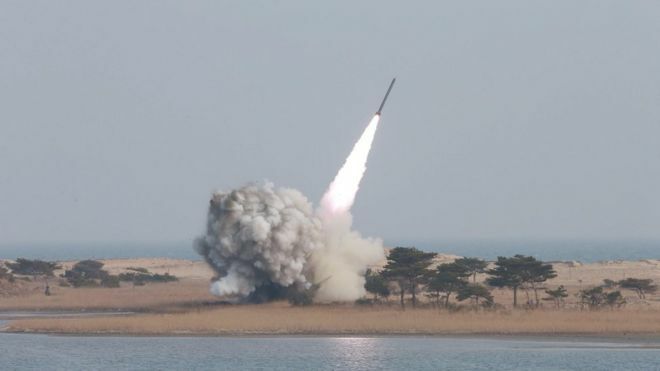 The missile was fired high into the air, reaching a maximum altitude of over 4,500 km, in an arc similar to the North's two previous intercontinental ballistic missiles, or ICBMs, which were launched in July. The distance travelled appeared to be significantly greater than that of the two previous ICBMs, which flew for 37 minutes on July 4 and for 47 minutes on July 28. David Wright, a senior scientist at the Union of Concerned Scientists, said the missile performed better than the two fired in July, with a potential range of more than 12,000 km, able to reach Washington or any other part of the continental US. "It's pretty impressive," Wright said of the test flight. "This is building on what they've done before. It's muscle-flexing to show the US that they're going to continue to make progress." Daryl G. Kimball, executive director of the Arms Control Association in Washington, said the new launch appeared to be the "most robust" ICBM test yet by the North Korea. "Early calculations suggest that it could reach the East Coast of the United States," he said. "However, that doesn't take into account the payload mass, which could limit the range."